Lakeman, R. (2007, 10-12 September). 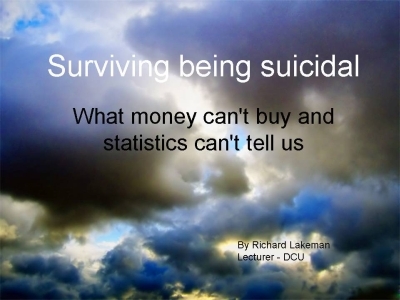 Surviving being suicidal: What money can't buy and statistics can't tell us. Paper presented at the Thinking, Feeling, Being: Critical Perspectives and Creative Engagement in Psychosocial Health, Dublin City University, Ireland. Increasing prosperity has not led to a reduction in suicide in most countries and neither has investment in epidemiological / risk factor focused research. Suicide is a pressing public policy issue and social concern but it also reflects an intensely personal struggle. This paper presents a review of the very limited literature examining the suicidal experience from the point of view of the suicidal person. It considers how people live with being suicidal. Lakeman, R. (2009, 24-25 September). A bad outcome: A discussion about research, outcome measurement and suicide [Keynote]. Paper presented at the Mental Health service users and research: Measuring success - different perspectives (RCN International Network for Psychiatric Nursing Research (NPNR) Conference), St Cross Building, University of Oxford. Attempted suicide or perceived suicide risk is a common pathway to psychiatric care and completed suicide the worst possible outcome. Nurses have an exceptionally important role to help people resolve suicidal crisis. However, the evidence base derived from formal research to inform their work is fairly thin. This presentation uses suicide research to illustrate some of the problems associated with mental health research, translating findings into practice and measuring outcomes. Suicidal processes (like much of interest to mental health professionals) are complex bio-psycho-social phenomena not easily reduced for the purposes of research. Health professionals ought to be mindful of how exporting the products and tools of research into practice, shapes the way they see their work and the people whom they care for. As well as extending research to explore how people recover from a suicidal crisis this presentation argues that research is inherently limited in the extent which it can inform care of the suicidal person and other ways of knowing must be valued and cultivated. Lakeman, R. (2010). 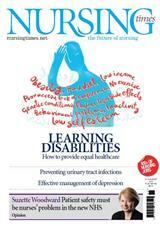 Maintaining wellbeing when a service user dies. 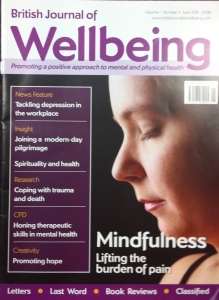 The British Journal of Wellbeing, 1(2), 28-33. People who work with the homeless are likely to be exposed to the trauma and death of services users. A theory of how workers deal with sudden death was developed through grounded theory analysis of in-depth interviews with people who had worked in the sector. Maintaining well-being involves positively framing the life and death of the service user and homeless sector work. This involves a number of related processes and factors, such as the nature of the encounter with death, responding to death emotionally and procedurally, and being involved in the marking of death and memorials of the person's life. Being able to recognise and respond to the vulnerability of self, peers and service users is also important. Successfully framing death enables workers to stay in the sector while maintaining their own wellbeing, enthusiasm for their work and compassion for users. This paper summarises the findings of a review and synthesis of qualitative research addressing how people live with or recover from being suicidal, focusing particularly on the implications for nurses in a range of practice settings. Most research relating to suicide has mostly assisted in identifying at-risk groups. Qualitative research can help in understanding the experience of the suicidal and the recovering individual. Despite different methodologies, sample groups and research questions some consistent findings emerge from this body of work which serve to highlight the pain, suffering and alienation attendant to the suicidal crisis. Qualitative research also reveals the importance of connection and engagement with people and the potential for nurses to make an important, even life saving difference to suicidal people through the way they relate to them. Lakeman, R., & Fitzgerald, M. (2009). The ethics of suicide research: The views of ethics committee members. Crisis: The Journal of Crisis Intervention and Suicide Prevention, 30(1), 13-19. Background. Good quality, ethically sound research is needed in order to better understand, appropriately respond to, and reduce the incidence of suicide. There is, however, a lack of clarity around the nature of ethical problems associated with suicide research and how to resolve them. This is a formidable challenge for ethics committee members in approving and monitoring research. Aims. To describe the views that members of health research ethics committee hold regarding ethical problems and ethical practice in research involving people who are, or who have, been suicidal. Methods. Ethics committee members were invited to complete an online survey addressing the risks, benefits, and ethical problems associated with suicide research. Findings were aggregated into themes using an inductive form of content analysis. Results. Concerns of ethics committees centered on accessing the population, potential harm to participants or the researcher, researcher competency, maintaining confidentiality, providing support to participants, and responding sensitively to the needs of family. Conclusions. Ethical research involving suicidal people requires both procedures to protect participants, and consideration of ethics as an ongoing negotiated process. The findings of this research provide a snapshot of views held by a number of ethics committee members. Lakeman, R., & Fitzgerald, M. (2009). Ethical suicide research: A survey of researchers. International Journal of Mental Health Nursing, 18(1), 10-17. Research is needed to better understand and respond effectively to people who are suicidal. Involving people who are suicidal in research poses some ethical and pragmatic problems. The ethical problems and difficulties in obtaining approval to involve people who are suicidal in research has contributed to the current paucity of research that explores the suicidal experience. To explore some of these problems, a web-based survey of suicide researchers was undertaken. Researchers identified from published reports were contacted by email and invited to participate in a web-based survey. Researchers were asked to describe any problems they encountered, how ethical problems were negotiated or resolved, and any advice received from human research ethics committees. The main problems identified were accessing the population, maintaining confidentiality, the extent of care owed by the researcher to participants, and the facilitation of support to participants. As with clinical practice, ethical research involving people who are suicidal involves a process of sensitive engagement, and careful consideration and remediation of risk. Aim This paper is a report of a review of qualitative research to address how people live with suicidality or recover a desire to live. Background. Suicide is a pressing social and public health problem. Much emphasis in suicide research has been on the epidemiology of suicide and the identification of risk and protective factors. Relatively little emphasis has been given to the subjective experiences of suicidal people but this is necessary to inform the care and help provided to individuals. Data sources Electronic searches of CINAHL Plus with full text, Medline and PsychArticles (included PsycINFO, Social Services Abstracts and Sociological abstracts) were undertaken for the period from 1997 to April 2007. In addition, the following journals were hand searched (1997–2007): 'Mortality', 'Death Studies’, 'Archives of Suicide Research’ and 'Crisis: The Journal of Crisis Intervention and Suicide Prevention’. Method A systematic review of the literature and thematic content analysis of findings. The findings were extracted from selected papers and synthesized by way of content analysis in narrative and tabular form. Findings Twelve studies were identified. Analysis revealed a number of interconnected themes: the experience of suffering, struggle, connection, turning points and coping. Conclusions Living with or overcoming suicidality involves various struggles, often existential in nature. Suicide may be seen as both a failure and a means of coping. People may turn away from suicide quite abruptly through experiencing, gaining or regaining the right kind of connection with others. Nurses working with suicidal individuals should aspire to be identified as people who can turn people’s lives around. Lakeman, R. (2009, 3rd-5th September). Has anyone seen Paddy? 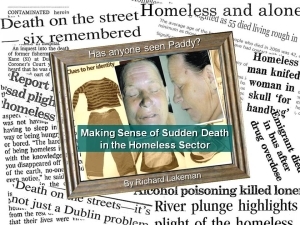 Making sense of sudden death in the homeless sector. Paper presented at the British Sociological Association Medical Sociology Group 41st Annual Conference, University of Manchester. Few groups experience such high levels of morbidity and mortality as the homeless. Those that work in the front-line delivering health, welfare and other services to homeless populations are likely to be confronted by the death of service users. Death may be intentioned (as in suicide), unintentional (as in accidental overdose), the end point of some pathological process (as in liver or renal failure), entirely unexpected, and often violent. Working with populations with such high risk profiles for sudden death and direct or vicarious exposure to such traumatic events taxes the coping resources of frontline staff. This presentation presents some preliminary findings from a grounded theory study which explored how front line staff cope or deal with sudden death of those whom they aim to help. Particular emphasis is given to social processes people engage in to deal with death and to how discourses around homelessness and addiction are drawn upon and reinforced through these processes. Objectives Research involving people who may be suicidal is fraught with ethical problems. There are few guidelines to assist researchers or review boards clarify and negotiate issues that may be specific to suicide research. This survey aim to describe these problems and how they might be resolved. Design: Experienced researchers (identified via published research) and ethics committee members were invited to complete an on-line survey addressing the risks, benefits and ethical problems associated with suicide research. Methods: Twenty eight researchers and 125 ethics committee members participated in the survey from Australia, New Zealand, Canada the United Kingdom and Ireland. Findings were aggregated into themes using an inductive form or content analysis. Results: A range of ethical problems were anticipated and addressed by researchers. Concerns of ethics committees centred on accessing the population, potential harm to participants or the researcher, researcher competency, maintaining confidentiality, providing support to participants and responding sensitively to the needs of family. Conclusions: Ethical research with people who may be suicidal requires both procedures to protect participants, and consideration of ethics as an ongoing negotiated process. Suicide is a pressing social concern but engaging with suicidal people in research is fraught with ethical difficulties. This paper presents the findings of a web based survey of experienced suicide researchers and human ethics committee members (from Ireland, the United Kingdom, Canada, Australia and New Zealand) on the ethical problems and ethical practice involved with working with people who may be suicidal. Ethical research involving suicidal people requires both procedures to protect participants, and consideration of ethics as an ongoing negotiated process. The findings provide salient pointers for researchers and practitioners to consider in their work with suicidal persons.